Picked this one up recently. Having sold my Xizang, I was itching for something new and wanted to try out the 29er thing. Well, this was what I found. I figured that I would get a much better feel/value for a 29er by buying a used bike versus paying the local dealer $100/day for a demo bike. I’m pretty certain I will be able to sell it for what I paid for it should I decide the platform isn’t for me. In case you’re wondering, this is a size Large. Normally I’d get a Medium, but this is what craigslist had that day, and since I’m about 5’ 11" (“tweener sized”), I’m borderline Large anyway. Fit seems mostly unnoticeable to me. The cockpit is nearly identical to my Trek dually. I’ve only taken it on one ride so far and came away mostly underwhelmed. I was expecting night and day differences from what I’ve heard and read about the 29er experience. I had a buddy ride my Trek, so I swapped back and forth throughout the ride, so I could get a good feel of the differences between the two. 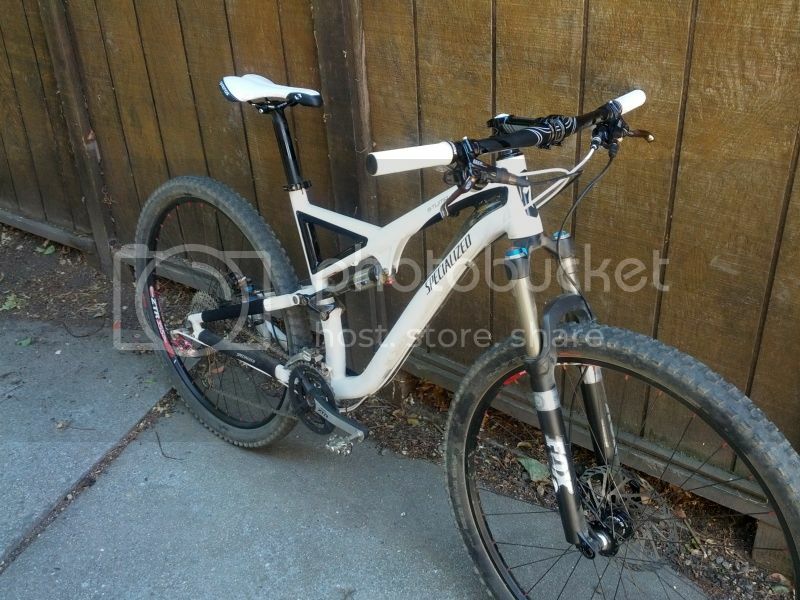 My first impression was that the trek seemed sooo much lighter and “flickable”. 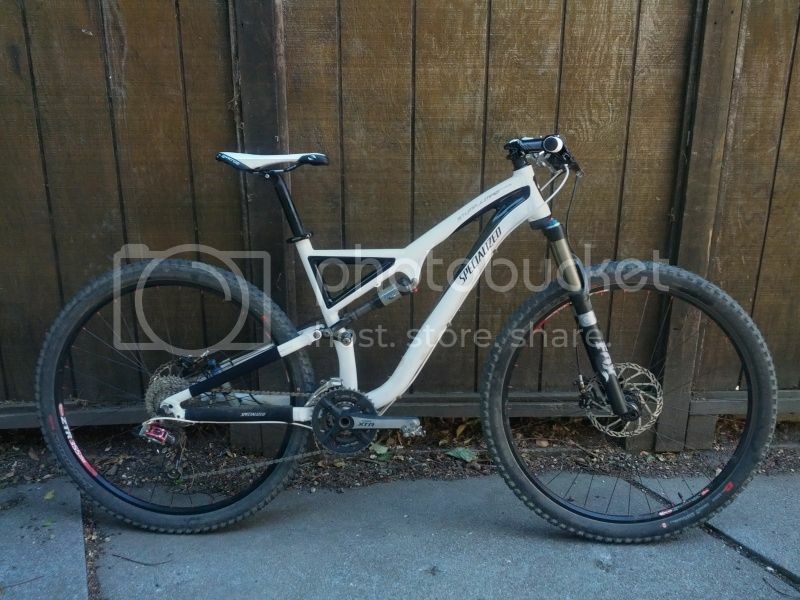 The Trek is under 25lbs with pedals, and the Stumpy is about 29lbs with pedals. The Trek’s smaller size also seemed to make it feel more maneuverable on the trail. I nearly wiped out a couple of times on the 29er. Something that never happens on my Trek. I’m sure it will take some more rides to get used to handling the bike, so I’m not really going to base my opinions on one ride so far. Another thing I noticed is that I felt like I bottomed out harshly a coupe times. I also hit my crank arms on some rocks. Both of these things have never happened to me on my trek (That I actually noticed). The Stumpy also seems to make A LOT of noise from the chain rattling around while descending. I’ll have to look into that. One thing I really liked, though, was the Brain shock. It was sort of like having the ProPedal lever ON automatically when I needed it, and OFF when I didn’t. This Stumpy Expert was stock except for a nice upgrade to the wheelset: black Chris King ISO hubs laced to Stans 355 29er rims, set up tubeless with S-Works rubber. This is also my first bike with a 15QR fork, so I had to order a Thule 15QR axle adapter for my roof rack. Personally, I found the 15QR system to be a little clumsy as far as getting the wheel on and off and the bike onto my rack. I also can’t tell how much stiffer it makes the front end compared to a regular 9mm QR fork/wheel. I’ve also never had a bike with SRAM on it. First impression is it feels clunky and overbuilt compared to the XTR stuff I am used to. Shifting was fine, but noisier and with a heavier feel to the triggers. The Avid Elixer brakes worked fine, but also seemed overbuilt compared to the XTR on my Trek. If I start to like the 29er after a few more rides, I may swap over my XTR brakes and drivetrain from the Trek and see if that really makes me a convert. 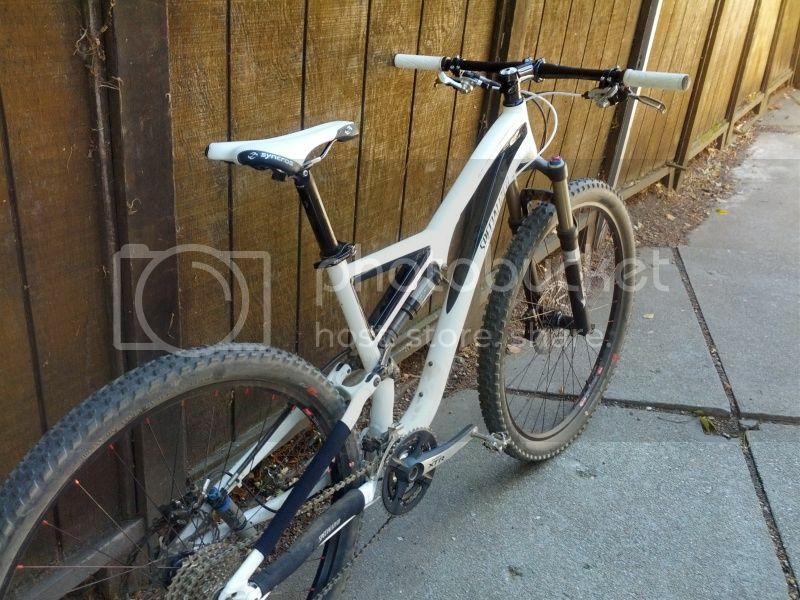 This entry was posted in Bikes on August 7, 2012 by bryanus.